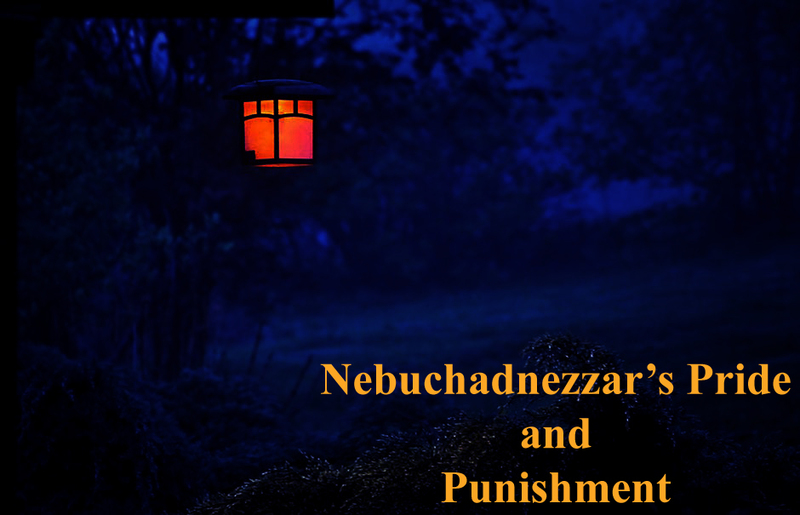 It is a story of Nebuchadnezzar’s Pride and Punishment. Nebuchadnezzar was the king of Babylon and he had become a very lofty because of he destroy the old city of Babylon and built a new richest, greatest and beautiful city in the world. In his city there were many temples, many chapels and many altars to be used for the worship of God Marduk. One night the king was scared because of his dream. He wrote down his dream and sent copies of it to the concern officers including Daniel. The king asked meaning of his dream but no one was ready to explain it, then the king called Daniel. Daniel explained like this, “Just like the great tree in the dream which was cut down, your mind will be changed and you will live in the fields with beasts. You will eat grass like oxen seven years will pass until you know that the Most High God rules the world and give the kingdom to whomsoever He wills. However, your kingdom will be kept safe for you.” A year after the king was very busy and forgotten about his dream. One evening while walking on the terrace and had a looked over the city and he becomes very proud because of he made the Babylon city very beautiful. At the same time he heard a voice, “Oh king now you are no longer ruler of city of Babylon.” Then the king started acting like an animal and lost his mind. The king was placed in a yard with a fence around him. He was eating grass like an ox, his nails and hair grow. After some years the king realized without God he was nothing. The king’s mind was restored at the end of seven years. So dear believers let us take a lesson from the moral story of Nebuchadnezzar’s Pride and Punishment this happened with him because of his own pride so humble yourself to God.